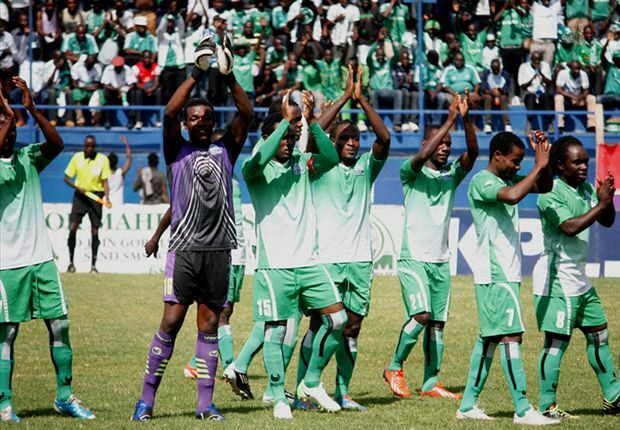 Gor Mahia and Thika United shared the spoils at Thika municipal stadium on Sunday. League leaders Gor Mahia were on Sunday held to a 0-0 draw by hosts Thika United in a SportPesa Premier League match at the Thika Sub-county Stadium. The result moved K’Ogalo to 52 points, nine ahead of second placed Sofapaka who drew 0-0 with Kariobangi Sharks on Saturday. “I am disappointed for the fans. I want to see more from Karin Nizigiyimana, I want to see more from Walusimbi and Meddie Kagere. They are international players. “I am not thinking about the title. Right now it’s about winning games and getting to know the formation that works best for the team,” said Gor coach Dylan Kerr. Kerr performed constructive surgery on the squad once more, preferring to reinstate award winning goalkeeper Boniface Oluoch in goal as well as right back Karim Nizigiyimana, while Ernest Wendo, who missed the last match against Chemelil Sugar due to illness, returned into the starting line-up. Jean Baptiste Mugiraneza and Wellington Ochieng both started as reserves but effective goalkeeper Peter Odhiambo was sidelined from the match completely. Thika United on the other hand, adopted a cautious approach to the game, starting with six defensive players as a measure to protect themselves from the massive threat posed by their visitors. Nicholas Muyoti started with Ugandan Allan Owiny between the sticks, with Christopher Oruchum, Benson Iregi, Suleiman Ngotho and three others providing cover for him at the back. The hosts were struggling to evade relegation and came into this match determined to clinch at least a point to avoid sinking to the very bottom of the league table. They started quite well, and although their chances in the first half were few and spread apart, Shami Kibwana managed to find the back of the net in the 30th minute. The goal was however disallowed for offside. K’Ogalo however enjoyed a better afternoon with more chances, although strikers George “BlackBerry” Odhiambo and Timothy Otieno were not at their best during the first half. Otieno missed a glorious chance in the 12th minute when his take off after receiving the ball was too slow and he was subsequently outran and dispossessed of the ball by his marker. Ugandan-born Rwandese player Meddie Kagere also missed a good chance three minutes later when he misdirected his shot outside for a goal kick. At the stroke of half time, Kagere suffered the same fate as Kibwana, when he headed the ball inside the net at close range, only to be deterred by referee Lucas Odhiambo who judged him to have score from an offside position. Second half substitute Francis Kahata left his team’s supporters holding their heads in disappointment in the 87th minute when he released a grass cutter that missed the target by an inch. Thika finished the match with just one shot on target, but they will treasure the result as it means that they have managed to squeeze out two points from the 15-time champions this season. 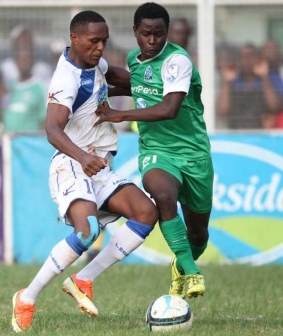 After three successive wins, including a 3-0 win over arch rivals AFC Leopards, Gor Mahia will bring their high flying act back to Nyayo stadium as they take on Thika United. Though confidence is running high in the Kogalo camp, coach Ze Maria will not let the team become overconfident. With the match being played at Nyayo stadium, whose playing surface has improved, Kogalo are certain to put their best foot forward. And the players will be rested after going a week without playing. “Now we have a week before our next match and I think this will be enough time for us to recharge as we work towards another victory.” said Ze Maria. Last season, Gor Mahia recoded excellent results against Thika United, by winning the first and second legs 2-1. This season, Thika under former Harambee stars ace , Nicholas Muyoti, are struggling and staring at relegation. They are currently at the bottom of the league table. 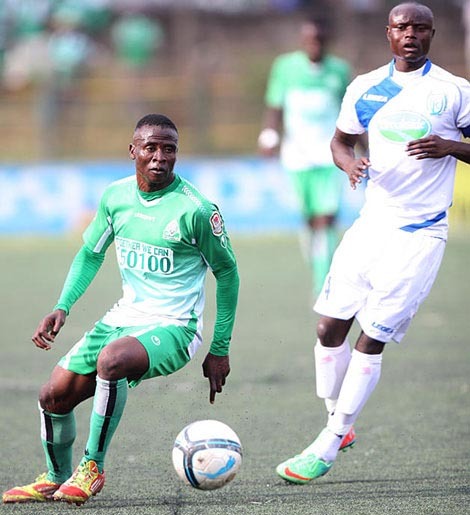 Gor Mahia managed a hard fought 2-1 win over Thika United on Sunday. Two goals and two assists from Jacque Tuyisenge and Eric Ouma “Marcelo” respectively were enough to give Gor Mahia the victory. All goals came in the first half. Lead striker Jacques Tuyisenge and wonder-boy Erick ‘Marcelo’ Ouma were a beauty for K’Ogalo ensuring two goals before 20 minutes of the game. Just a few minutes after Thika United defender Suleiman Ngotho had cleared a threat posed by Francis Kahata from a free-kick, ‘Marcelo’ crossed from the left to rightfully find Tuyisenge’s header hitting the net for Gor Mahia’s opening goal in the 13th minute. The Rwandese, who is among the contenders of the league’s Golden Boot Award, was well placed again four minutes to connect ‘Marcelo’s cross for the second goal in what was a replica of the first goal. With that happening, coach Ze Maria’s tactics were paying off after he surprisingly redeployed ‘Marcelo’, who has been at the left-back to a forward role for the first time ever since he joined Gor Mahia late last year. 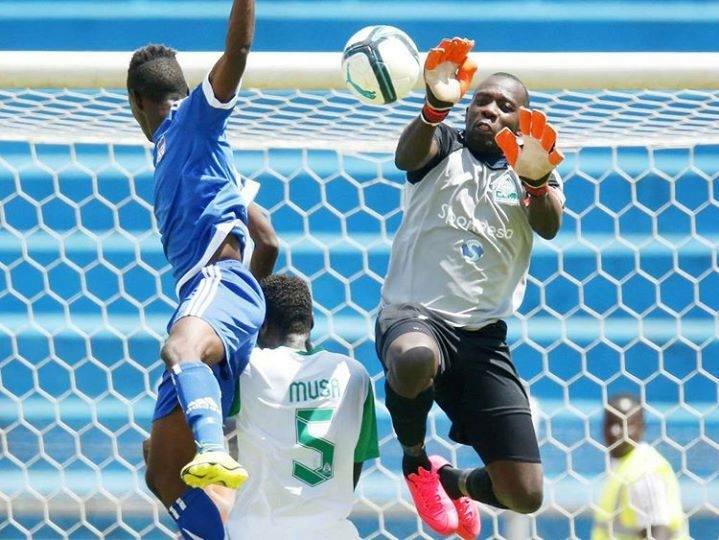 By the 39th minute of the game, K’Ogalo had outweighed the milkmen in all departments forcing former Muhorni Youth keeper Martin Elunga’t to expensive saves. Innocent Wafula, Francis Kahata and Ouma were all over the pitch terrorizing the likes of Dennis Odhiambo, Suleiman Ngotho, Timothy Luda and Samuel Mwanje. However, a little blunder cost the visitors a minute later. Keeper Jerim Onyango paid little attention to Eugene Mukangula’s move to an extent of letting a loose ball go through to the net for Thika United’s consolation. That was a blunder. The remaining five minutes of the first half could not change the situation and so the teams had to wait for what the second half brings on the table. Just like the first half, the second half was commissioned by a free-kick for Gor Mahia and Kahata was the man at it once again despite being fruitless. Harun Shakava’s header then missed the target by a whisker thereafter before Ernest Wendo was forced to clear a threat from a Sammy Meja free-kick. Baron Oketch’s inclusion in the 74th minute stirred up the visitors’ spirits but Thika United had resorted not to allow any other goal past Elung’at. In fact, he rose to save what would be the third goal for K’Ogalo on the injury time when Tuyisenge came with a job-finishing shot a few seconds to the final whistle. Thika United Starting XI: Martin Elungat (GK), 23. Sammy Meja, 12. Bincent Nyaberi, 4. Dennis Odhiambo, 16. Suleiman Ngotho, 13. Michael Luvutsi (Michael Mutinda 78’), 35. Samuel Mwanje, 22. Ray Omondi (11. Salim Mzee 62’), 7. Joel Tata, 10. Eugine Mukangula 8. Timothy Luda. Unused subs: Hamuza Muwonge (GK), Wilson Anekeya, 27. Erick Lisula, 3. Baraka Badi, 5. Vincent Omumbo. Gor Mahia Starting XI: Jerim Onyango (GK), Harun Shakava, Musa Mohammed, Karim Niziyigimana, Abouba Sibomana (Baron Oketch 75’), Ernest Wendo, Francis Kahata, Innocent Wafula (Amos Nondi 64’), Erick Ouma, George Odhiambo (Enoch Agwanda 83’), Jacques Tuyisenge. Unused subs: 16. Gradus Ochieng’ (GK), Bernard Odhiambo, Ronald Omino, Jacob Keli. Nigeria football legend Nwanwko Kanu was scheduled to meet with his old for Ze Maria on Wednesday at the Gor Mahia training ground. The two players were on opposite ends of the field on July 31st 1996 when Brazil and Nigeria met in the 1996 Olympic semi-finals. It is one of the strongest teams Brazil has ever fielded with legends and world cup winners like Bebeto, Ronaldinho, Aldair, Juninho, Ronaldinho and the original Ronaldo, one of the greatest strikers ever. Current Kogalo coach Ze Maria was deployed at full back. Brazil —Dida, Ze Maria, Aldair, Ronaldo Guira, Roberto Carlos, Flavio Conceicao, Amaral, Juninho, Ze Elias, Bebeto, Ronaldinho. Nigeria —Dosu, C. Babayaro, Ukechukwu, West, Obaraku, Babangida, Lawal, Okocha, Amunike, Kanu, Amokachi. Nigeria went on to beat Argentina 3-2 in the final. It was Kanu’s coming out party where he announced himself to the world. His career was slowed down by cardiovascular issues. And after a few stellar seasons at Inter Milan and Arsenal, he was never able to scale those heights again. Kanu is now a goodwill ambassador. This week he has held football clinics at Eastleigh secondary, donated balls to football academies and visited cardiovascular patients at Kenyatta hospital. Gor Mahia legend Hezborn Omollo, after scoring nearly sixty league goals between 1983 and 1985, also saw his career slow down significantly when he developed heart problems. Hopefully the visit from Kanu will inspire Kogallo to pick up where they left on Saturday and beat Thika United. The two sides meet at Nyayo stadium on Wednesday. Rwandese striker Jacque Tuyisenge did not disappoint in his much awaited debut. He recorded an assist followed by a goal. Though he hobbled out of the field on Saturday, he has resumed training and appears ready to go again on Wednesday. “I want to give my best input in the match and help my club achieve its target. It has not been easy for us, with many challenges that are now behind our back. My work as a striker is to score goals and that is what I want to do tomorrow (Wednesday) if the coach will consider me,” said Tuyisenge to supersport. Whereas Gor Mahia are buoyed after beating Kakamega Homeboyz 3-0, Thika are coming off a 0-0 draw with tough Posta Rangers. “The league is still too early to call, but the fact that Gor Mahia won their first match of the season gives them some advantage. We were unlucky not to win and so this gives us the required motivation,” said James Nandwa the veteran Thika coach . Nandwa was hired by Thika United this season. In his heydays as a player, he starred for Harambee stars at the 1987 All Africa games. At the time he was playing for the then popular Thika based side KTM. This is therefore a return home for him. But it has not been a happy return as Thika United have not been impressive this season. They are currently in 14th place with three losses and three draws. And they will be without key defender Dennis Odhiambo who is suspended. Gor Mahia for the part will welcome back the Ugandan midfield duo of Walusimbi and Aucho. And in addition to Tuyisenge, Gor Mahia have a cadre of strikers, each eager to impress Ze maria. One of them is Jacob Keli who was the subject of a lot of criticism after his slow start at Gor Mahia. He silenced some of those critics when he scored on Saturday. Another player who is slowly silencing critics is Jerim Onyango who has put on a solid display between the sticks ever since he was re-inserted into the starting line-up. He spent most of 2015 on the sidelines and remained positive. When given a chance to re-stablish himself, he has taken the opportunity with both hands. THE fact that Ze Maria has stayed with Jerim shows that he has impressed the new coach as well. Last year Gor Mahia beat Thika United 2-0 at home and beat them 2-0 again away. Rwandese striker Jacque Tuyisenge has been advised by team doctors to take two weeks off. “He played very well in our last league game but it appears that he injured his ankle during that game though he didn’t think it was serious. He trained with the team on Monday, but the doctor advised that he stays away for the next two weeks to allow the ankle to heal,” said Tom Ogweno to the KPL website. Rushing a player back before he regains full fitness can only lead to further complications. This is therefore a prudent step by the medical staff. In addition to the ankle setback, Tuyisenge admitted that he had not fully recovered form the knee injury which kept him out of the start of the season. “The knee injury was bad and even now I feel some little pain when I step down hard. I still train anyway, because I want to be strong and fulfill my obligations. Today I twisted my ankle but I will still go to training and see what the doctors will say,” he said to the KPL website. A knee injury that has not healed entirely can cause problems in the other leg because a player may over-compensate with the other leg. As such the medical staff will need to tread carefully. 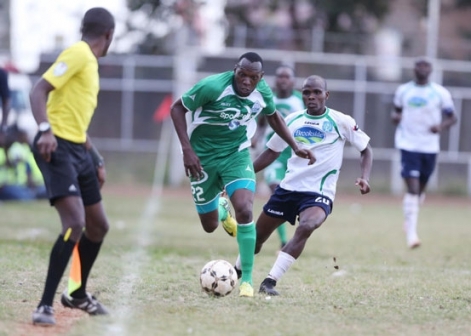 Gor Mahia continued what looks like an unstoppable march to their third succesive title when they sunk Thika United 2-0 in a midweek match played at City stadium on Wednesday. 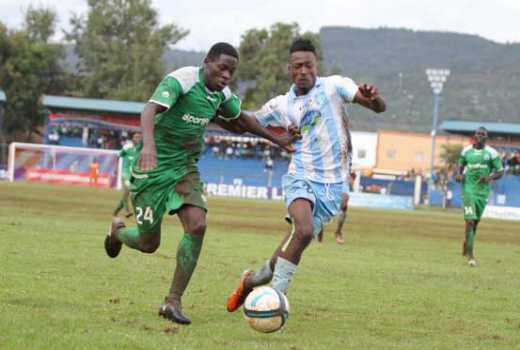 Thika held Gor Mahia to a scoreless first half, but Gor Mahia was the better side and could have taken the lead as early as the 3rd minute but Olunga failed to connect with a Meddie Kagere’s cross. In the 5th minute, Thika goalkeeper Hamza Muwonge made a double save, parrying away Walusimbi and Ali Abondo’s efforts into fruitless corners. 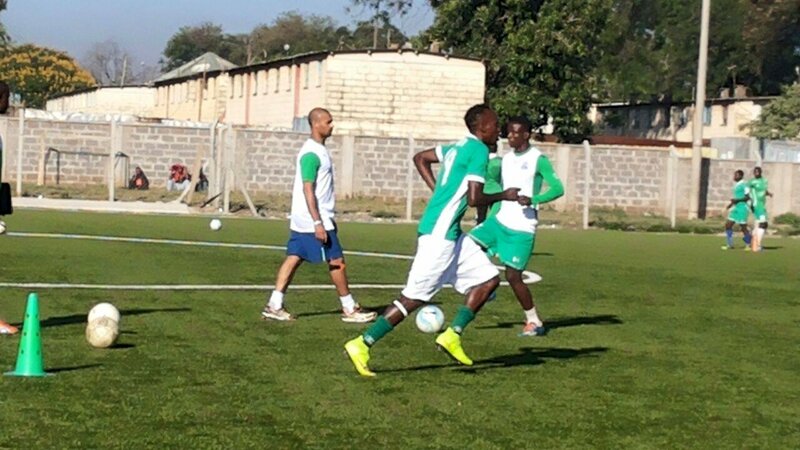 Gor Mahia continued to press forward. In the 36th minute, Collins Okoth’s goal-bound effort was blocked by a Thika defender. 5 minutes later, Vincent Nyaberi dealt carelessly with a cross from Kagere and almost scored an own goal. The second goal came from yet another poor clearance from the Thika Backline. This time it fell to Olunga who leaned back and headed the ball home for the second goal. Coach Frank Nuttall lauded his team for their focus. After the match, Thika coach Tim Bryett said he had no regrets about his team’ s performance. “There is no shame in losing. We are rebuilding and we have some things to focus on”, said Bryett. Gor Mahia Starting XI: 23. Bonface Oluoch. 5. Musa Mohamed. 14. Karim Nizigiyimana. 3. Abouba Sibomana. 6. Collins Okoth. 30. Ali Abondo [. 29. Innocent Wafula 73’] 18. Harun Shakava. 22. Meddie Kagere. 2. Godfrey Walusimbi [7. Ronald Omino 83’],19. Michael Olunga [24. Enock Agwanda 79’], 10. Khalid Aucho. Unuesd subs: 1. Jerim Onyango, 15. Bernard Odhiambo. 25. George Odhiambo. 17. Eric Ochieng’. Subs: Mark Omwansa, Ronny Katumanga, Vincent Omumbo and Timothy Luda. Its a difficult assignment as Gor Mahia take on Thika United at Kasarani on Madaraka day. Thika will not be an easy task as they are currently fourth in the standings with 22 points. And last season, Thika United proved a difficult proposition for Gor Mahia with both matches ending in draws (0-0 and 1-1). But this season Thika are facing a different Gor Mahia side that has proven to be rampant in front of goal. A team that is hitting on all cylinders. These mind games will not work on Gor Mahia which under Frank Nuttall is a disciplined and focused unit. And given the experience available on this team, they will not yield to pressure. Every other team in the KPL has been pointing fingers at Gor Mahia for various reasons. Whether it is Logarusic accusing Kisumu stadium management of favouring Gor Mahia or Bryett and other coaches accusing referees of favouring Gor Mahia. Gor Mahia fans should therefore show up in large numbers at Kasarani and throw their support behind the team. Gor Mahia’s dissapointing pre-season continued when they went down 2-1 to Thika United in a friendly match on Sunday at City stadium.. It was Thika United who first took the lead when they awarded a penalty for a handball. Dennis Odhiambo duly converted the penalty. Jerry Santos equalized in the 22nd minute with a superbly taken free-kick as both sides went into the breather tied. Gor Mahia fans will be right to be concerned. One week before CAF champions league match against CNaPs of Madagascar and the attack is still blunt. The defence is showing signs of being porous. It is worth noting that even Nakumatt was able to get a good result against Power Dynamos of Zambia. 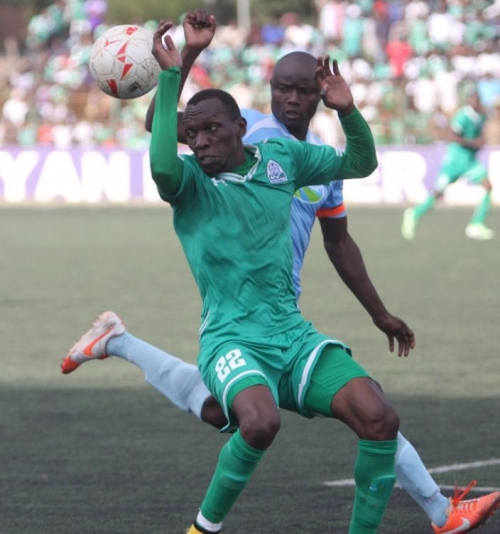 With the dust of transfers still not settled, Gor Mahia will resume their Tusker Premier league campaign on Sunday against Thika United at City stadium. the match is set to kick-off at 4:15 pm. 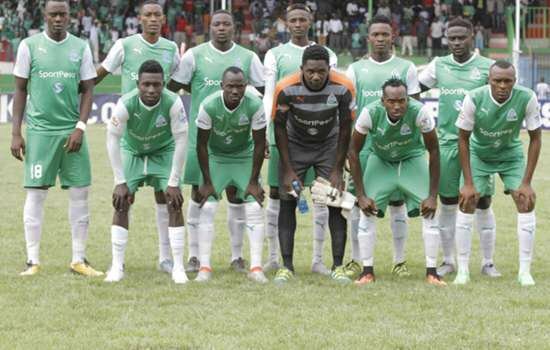 Gor Mahia will be hoping to put their campaign back on track after it was seemingly derailed by internal turmoil, constant transfer rumours and instability that has seen the team fail to win in the last four games. The good news is that Gor Mahia is still atop the league standings especially since second placed Tusker faltered in their midweek match. But Thika is no pushover. It was they who were the first team to pick a point from Gor Mahia this season. They stopped Gor Mahia’s winning run when they forced a 0-0 draw during the first leg. Fans will be eager to see if prodigal son Collins Okoth “Gattuso” can regain the form that he displayed for this club back in 2011. With Sserunkuma away on trials, new Ugandan striker Arthur Semazzi could step into the breach. Am delighted with the move,” Semazzi told Kawowo Sports immediately after putting pen to paper. “Gor Mahia is a big club with rich history and am proud to be part of this great club. Am looking forward to repaying the faith vested in me by all officials at the club including the technical staff,” said Semazzi to Kawowo sports. Coach Williamson may however opt to give Semazzi and new striker Timothy Otieno more time to settle into the system. In which case he could field returnee Patrick Oboya who has been out of action since FIFA raised concerns about his ITC in April. Fans should turn out in large numbers to raise the morale of the players and help them reclaim the form they displayed during the March-April period.